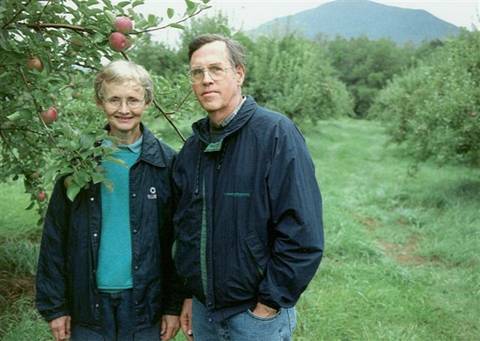 We are Sylvia and Tom Smith, and we began to restore the Mad Tom Orchard in 1999. Planted in 1940 by the Parsons family, the orchard was purchased by Tom’s dad in 1962, and run for many years as a commercial orchard, then as pick-your-own. Loss of the airplane spray service forced the orchard to close in 1997. We now have pruned over 100 of the best old trees and planted 1200 new trees bringing 8 acres back into production. The old trees are big and beautiful, and are all McIntosh and Cortland, two premier New England varieties. The new ones include more of these two old favorites plus Gingergold, Zestar, Sansa, Gala, Honeycrisp, Macoun, Empire, Golden Delicious, Northern Spy, and Crimson Crisp. Fruit is available on the old trees and the new trees as well. The mountains around us provide the views, the refreshing breezes, and a perfect spot to enjoy autumn in Vermont.